Easiest Hollandaise Sauce: No Whisking Required! Who knew homemade hollandaise sauce could be so easy? Our blender version comes together in minutes with zero effort, no whisking required. I love hollandaise sauce. 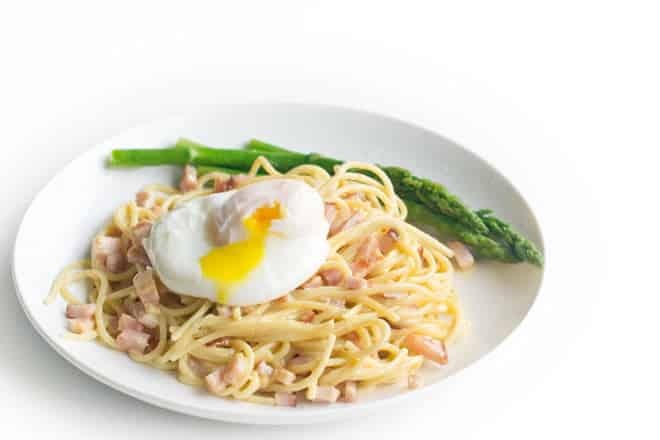 On poached eggs, on asparagus or licked off a spoon. But I only made it once. It was such a pain. You have to do a lot of whisking in a double boiler to slowly thicken the eggs without cooking and scrambling them. 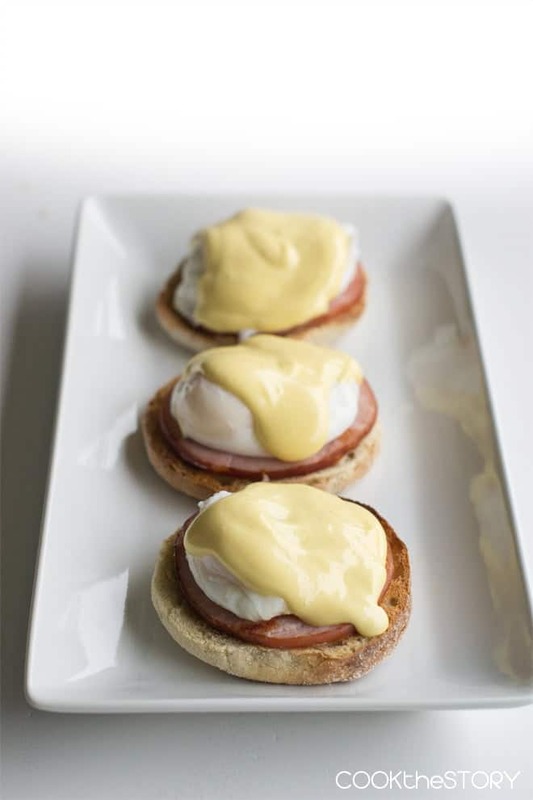 Here’s a basic hollandaise recipe. See what I mean by all that whisking? 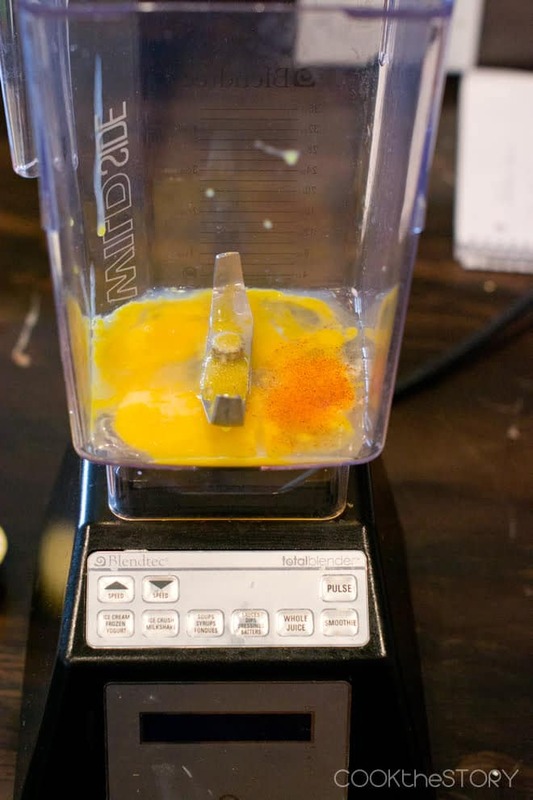 Learning to make it in a blender changed everything. It’s so easy to do. And no whisking. None at all! Separate the eggs. You only need the yolks here. 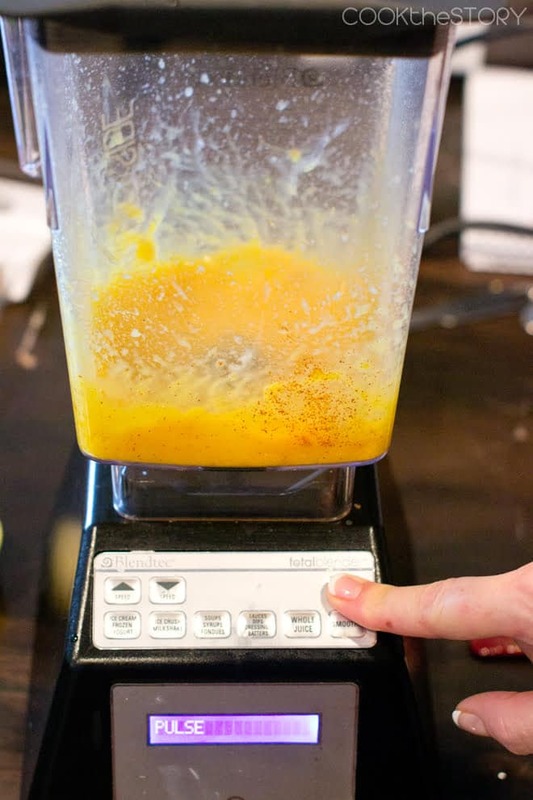 You put egg yolks in a blender with a bit of lemon juice and a pinch of cayenne. Then melt some butter until it’s warm and steamy. I do this in the microwave. 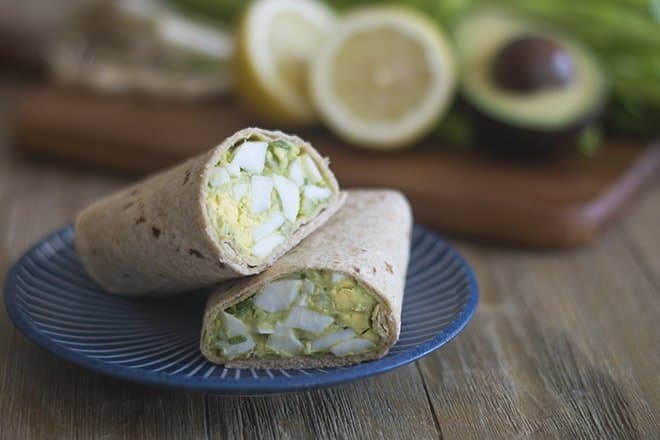 Pulse the eggs to get them mixed up a bit. Then run it on medium speed while you slowly drizzle in the warm butter. By the time the butter has been completely added, the mixture will be thick. Continue to blend for another 30 seconds. That’s it! So easy. And seriously delicious. Now that I’ve learned how to make hollandaise sauce the easy way, I make it all the time. Now that we’ve tackled hollandaise, it’s time to finally master poaching eggs. It took me a while to figure out the best way to do it but now that I know how, I’m ready to share it. Learn how to poach eggs perfectly (and easily) over here. Put the eggs, lemon juice, salt and cayenne in the blender. Pulse a few times to mix. Scrape down sides of the blender. Melt the butter in the microwave until melted and steaming. With the blender running at medium speed, slowly drizzle the butter into the eggs. It should thicken by the time you’ve added all the butter. Continue to blend for an additional 30 seconds for additional thickness. Video and asparagus photos are by Leigh Olson. Recipe by Cook the Story. This post originally appeared in April, 2015 and was revised and republished in April 2019. Disclosure: This post contains affiliate links meaning that if you click on one and then buy something, I will receive, at no additional cost to you, a small percentage of the sale price. All opinions are my own. This is amazing! I made this the other night and my husband couldn’t get enough! 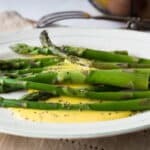 This is a fantastic recipe that makes hollandaise a more than “Special occassion” item!! I have used the double broiler method before (which is tough when I don’t own one… the two bowls never fit right!) but the SO couldn’t tell the difference with this recipe, and he is PICKY!! Only tip… my cheap blender doesn’t warm the sauce, and 15 seconds in the micro -barely- started scrambling the eggs. So I put in a ceramic bowl on top of the stove while I finished cooking the meat/eggs, and then did a quick 10 seconds in the micro. Fabulous! Thanks for the awesome recipe! Yay! I’m so happy you like it and thanks for the great microwave tip! I made this in my ninja! It was great! Awesome! So glad you liked it, Shona! This is the most incredible recipe I’ve ever used…. Eggs benedict is one of my favourite meals ever…. and having been to a million restaurants and been (mostly) disappointed, my husband finally learned to make them. Tired of asking him to make them for me, I decided to try this recipe. IT IS THE BEST! Not only do I get 4 eggs benedict brunches for 3 people, it is also EASY TO MAKE. After making the initial batch, I then portion freeze the hollandaise and when I plan to make it on Sundays, I either, let it thaw the night before, or sit it in a dish of warm water to soften. I then add a touch of lemon juice before microwaving it for 15 seconds. It’s great every time! Thank you so much for this recipe! Jan, You’re welcome. So happy you like it. Thanks for letting me know! First attempt came out great! First attempt at Hollandaise as everyone says it’s so hard to get right and it worked a treat!! Very impressed as such as easy recipe and tasted great :) more eggs bene for us! Fantastic, Emma! I agree that this is so simple and works beautifully. I love it too! This was my first attempt at trying to make hollandaise sauce and it came out perfectly! Thank you for helping me with a successful breakfast! I lovvvvve this stuff, when it works for me that is. So I’ve tried this method (The Pioneer Woman’s version) a handful of times and it always takes me one failed attempt before success. Tonight I tried 3 times and none of them came out :( I was so disappointed. I’m using a Vitamix blender and when it fails it always just stay liquidy and never thickens up. I’m sure to get the butter hot and pour it in slowly. In her recipe she uses 3 egg yolks as opposed to 6…so may try your way next time as it’s been so hit or miss for me. Has that ever happened to you where it never thickened? any more detailed suggestions on how to ensure success because it’s the most delicious recipe when it works! Kristen, It always works for me. I’ve tried it in my Blendtec and in a regular blender. 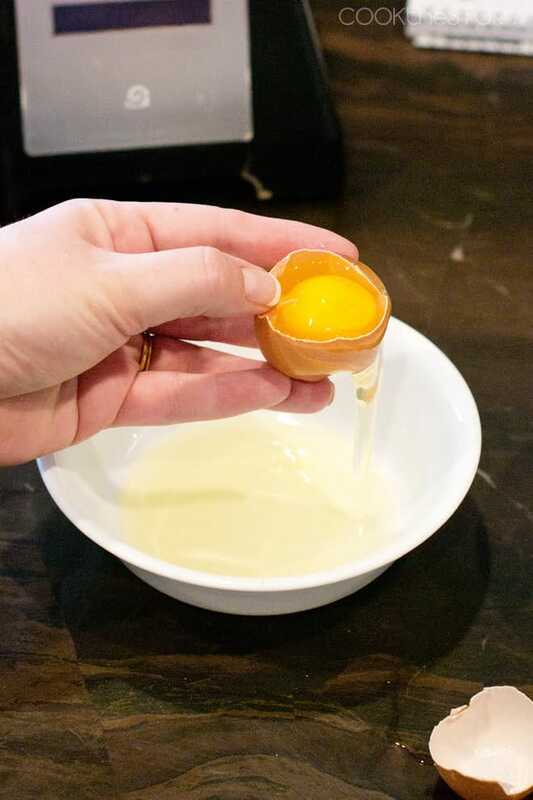 The extra egg yolks might help since that is the ingredient that is the actual thickener in the recipe. When egg yolks warm up they thicken up. The warm butter is making the egg yolks cook and thicken. 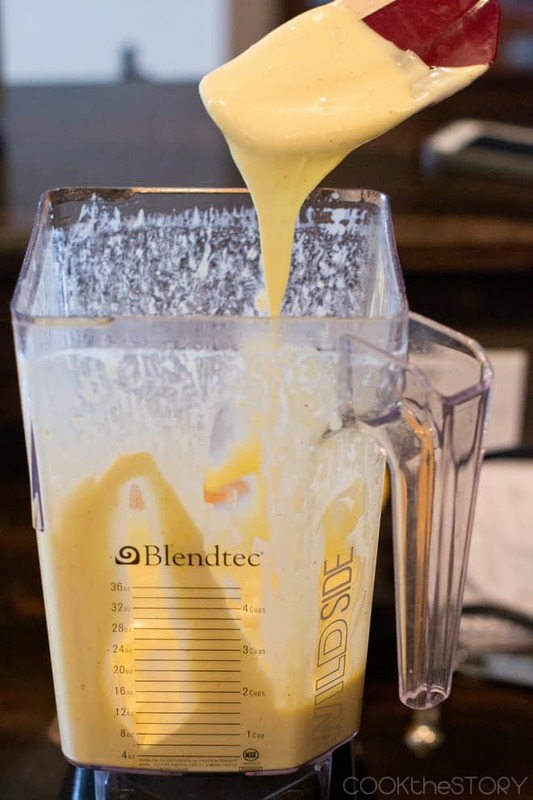 I will say this…I’m not positive given the ratio of eggs to butter that you’re using (I don’t know what your ratio is) but if it doesn’t thicken in the blender, you should be able to transfer it to a double-boiler and then whisk it over heat until it thickens. But try the 6 yolk version first. The first time I made this I used pasteurized eggs and didn’t heat the butter too much – just got it melted. It turned out amazing!!! This time I used regular eggs with the hot butter .. It looked fine at first but heated it up in the microwave for the 15 seconds and stirred and it was Like scrambled eggs! Colleen, I think if your butter is too hot, it can cook the eggs. Also, only heat the hollandaise in the microwave if it has gotten to room temperature or cold. If you put the hot butter in with the eggs and blend it and then put it in the microwave while it is already pretty warm, it could definitely coagulate the eggs. Note that I don’t think the pasteurized versus unpasteurized eggs had any impact on the success here. I think it was just the heat of the butter and then heating in the microwave right away afterwards. I hope that helps. I’ve been using a hand-held blender for a while now and works great. I’ve never tried it with a hand-held blender. Do you use this method with warm butter, and not heating anything on the stove? Or do you use the hand-held blender as you would a whisk and make the sauce the traditional way over a double-boiler? Karen, It is all going to depend on your eggs. If you use fresh eggs (the Best Before Date is a few weeks away still) then it should keep for 3-4 days. I would experiment with freezing it too. I just did some googling and found some people saying that you can freeze it if you stir it while reheating it. 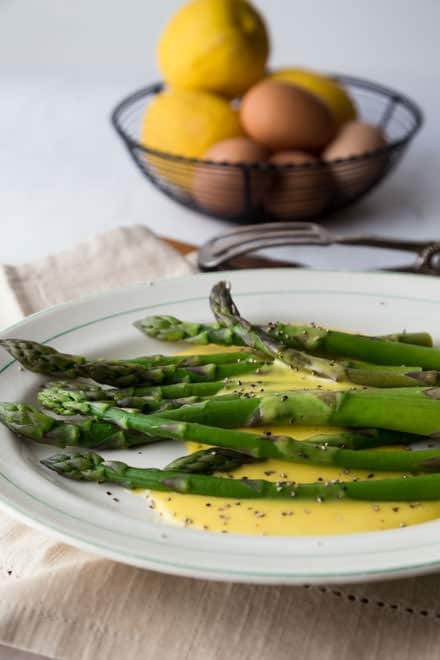 Wouldn’t it be great if you could have a bunch of little portioned containers of hollandaise in the freezer to pull out when someone wants one? Worth a try for sure! Let me know how it turns out. A great way to keep the sauce warm is to put it in a to-go coffee mug! What a fantastic idea, Jamie. Thank you!! Hey, thanks for the reminder!! Hollandaise sauce is one of the low carb, high protein treats I promised myself once I felt comfortably settled into maintenance. Yes, this yumminess is low in carbs and (in moderation) fits right into my plan. No English muffins, of course, but that’s a minor issue. Fantastic! It’ll be delicious even without the English muffins, for sure. 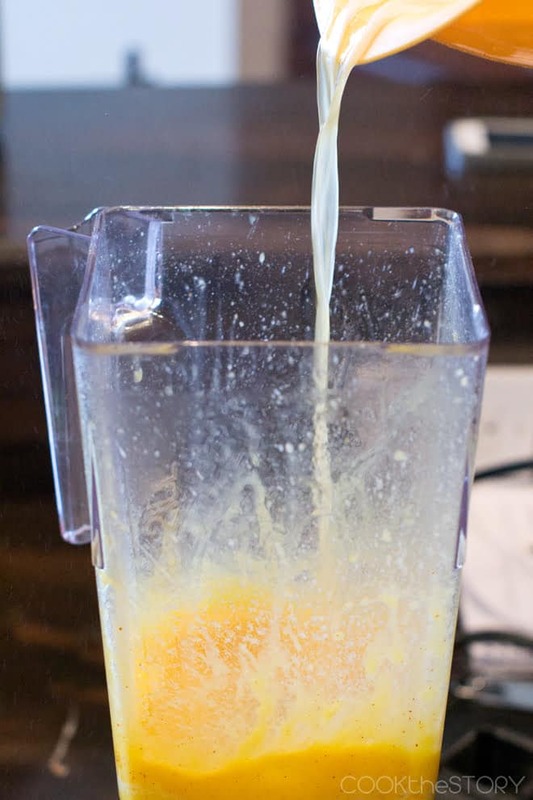 I don’t have a blender… Is this perhaps possible in a food processor? Kate, I think it would work in a food processor. Just get it going on the fastest speed and make sure your melted butter is very very warm. Drizzle it in slowly. 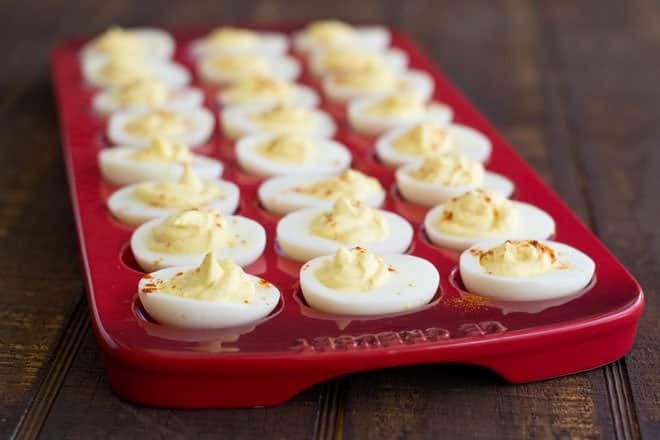 The idea is that the hot butter is added slowly to the eggs so it doesn’t cause them to solidify. Instead, the gradual addition of the butter cooks them slowly and just thickens them. On hte off chance that some egg coagulates, strain the sauce through a fine mesh sieve before serving. But I doubt it will happen. Totally great way to use your blender!! 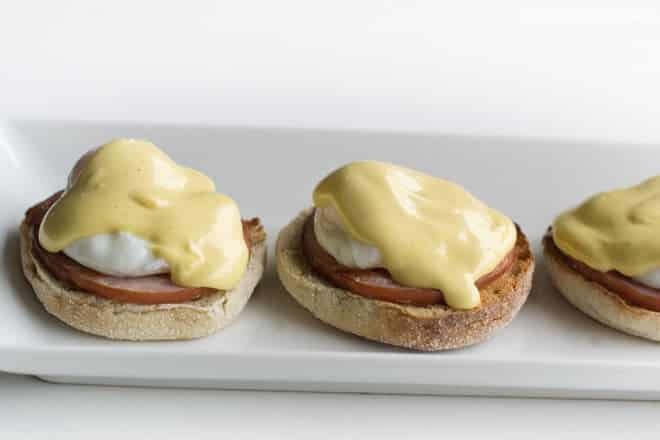 I love hollandaise, and will definitely give it a try in my Blendtec next time I whip up Eggs Bene!! This is a great method for making hollandaise. Will use it for my next brunchtime Eggs Benedict extravaganza. I am very excited about this! My son-in-law loves this sauce and now I can look like a hero! Do you love your blend-tec? Just got mine and I do love it!